We’re two aging therapists who’ve worked with abused children and adolescents for many years and are keenly interested in the neurobiology of attachment. We met a few years ago, when we were asked to work with an agency that wanted to incorporate an attachment-based model in their treatment of highly stressed kids, teens, and their parents. This story of the new therapeutic path that emerged as a result of this collaboration starts, as so many do, with a failure. There was one case at that time that Dan found particularly galling. He’d begun providing treatment for a young mother, Rebecca, and her 4-year-old son, Eric. The family doctor had described her as being a tense, discouraged mother, overwhelmed by the day-to-day responsibilities of caring for her son. Still, she’d seemed to want help for herself and her son, and agreed to see a therapist. Yes, she said, when Dan did her intake; she was discouraged, all right—and frustrated! Eric was impossible! Why wouldn’t he just do what she asked? Why was everything a fight? Why wouldn’t he play by himself when she just wanted to relax? Why wouldn’t he eat? Sleep? The list of complaints seemed endless. Dan was pleased and hopeful after his first few sessions with Rebecca. She demonstrated genuine sadness about her degenerating relationship with her husband, Eric, and she appeared to understand how being ignored by her own parents might have had something to do with her struggle to parent her son effectively. She was all attention when Dan told her that her son needed her attuned interactions, and that if she related with empathy while she set firm limits, he was likely to begin to cooperate with her and accept her authority. However, she rarely seemed to put Dan’s suggestions into practice; she kept bringing in the same problems week after week. Dan began to feel disappointed and discouraged. Soon, she started saying resentfully that Dan’s ideas “weren’t working” as she grew even more frustrated with her son’s unimproved behavior. She hinted that maybe Dan’s advice was off-base—that he might be missing something and didn’t really understand Eric’s intensity. Finally, Dan asked why she’d reacted with so much anger instead of empathy when her son screamed at her. The tone of his voice conveyed his impatience with her, as did his message that, by now, she should’ve been responding to her son the way he’d tried to teach her. Dan began to dread his sessions with Rebecca, and after a couple more of these stalemated meetings, she stopped coming. Eric went back to live at her mother’s house, Rebecca went back to her defeated sense of resigned failure as a competent mother with a happy child, and Dan went back to looking for parents who’d appreciate what he could offer. At about the same time that Rebecca stopped coming for her sessions with Dan, he and I began to explore together the practical, clinical implications of the interesting new brain research for the work we were already doing with traumatized children. We’re both steeped in the model of interpersonal neurobiology developed by Allan Schore and Daniel Siegel, and we felt we had a good grasp on the struggle that neglected and traumatized children faced in making the shift from mistrust to trust. We knew that attachment research clearly linked the development of secure attachment to the quality of caregiving kids receive—to connections with what Schore called a “psychobiologically attuned caregiver.” In short, we knew what these hurt kids needed from their caregivers: the ability to stay engaged and open with them, especially when the kids were “going defensive” and resisting the closeness they deeply needed but instinctively avoided. As we focused more on the new perspectives that attachment theory and interpersonal neurobiology were opening up on failed cases like that of Rebecca, we began to look at parents in a different way. 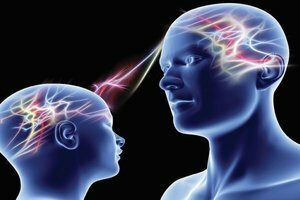 One morning, we had a shared epiphany: we finally realized what we’d “known” for a long time: parents’ brains work the same way that their children’s brains work! Just as a child has to feel safe to approach a caregiver, a parent has to feel safe to approach and trust a therapist. Parenting isn’t a cookbook activity for managing children’s behavior: it’s an ancient mammalian mind–heart process, which allows a caregiver to stay engaged and regulated enough to sustain the mind-to-mind, heart-to-heart connections that are vital for a child’s development. Parenting is rooted in openness and safety, not in survival-mode self-defense. We realized, then, that just as our awareness of attachment and its neurobiological foundations informed our practice with children, understanding the neuropsychological foundations of caregiving would make us more effective therapists with their parents. First, we needed to learn what actually goes on in the parenting brain. Then, we needed to understand how stress affects the parenting brain and sometimes leads to blocked care. With a brain-based model of parenting and blocked care, we hoped to get better at helping stressed-out parents get unstuck and tap their potential for caregiving. What does well-functioning brain-based parenting look like? It looks something like Sarah. Sarah, the mother of 12-month-old Vincent, is watching two different videos of her son while having her brain imaged. In one scene, Vincent is laughing gleefully as Sarah blows big, wet bubbles at him; in the other, Vincent is crying because Sarah has just left the room. As Sarah watches Vincent as a happy baby, parts of her left hemisphere, including regions comprising her pleasure system, especially the nucleus accumbens, light up on the imaging screen. This left-brain system is keeping Sarah in her brain’s approach mode, fully engaged with Vincent, and is activating her brain’s reward system as well. Although we can’t see it on the screen, chemicals such as oxytocin and dopamine are flooding the limbic regions of Sarah’s brain as she looks at her laughing baby. Oxytocin is like antianxiety medicine, helping to keep the parent’s defense system off and the approach system on, which is the real secret to staying parental toward your child. When Sarah watches the scene of Vincent in distress, parts of her brain on the right side, which are associated with responding empathically to a loved one’s pain, become active. Now, different chemicals, including one much like adrenaline, are spurting into regions of her brain that ramp up her parental vigilance, making her intensely aware of Vincent’s distress. Her anterior cingulate cortex (ACC) becomes active, in conjunction with the insula, the “visceral brain,” helping her feel Vincent’s pain and causing her to experience a compelling urge to comfort him. Like Sarah, Rebecca had initially experienced a strong desire to be with her infant son and felt pleasure in providing for his care. Oxytocin was being released in her brain at his birth and when he was gazing into her eyes while she was holding him in her arms and swaying as she hummed to him. This led to the release of dopamine, and she enjoyed being with him and anticipated further pleasure from their interactions. Yet these systems of parental approach and reward weren’t all that robust because they hadn’t been strengthened enough when Rebecca had sought to connect with her parents as a child. After a while, she learned to turn off this reward-expectancy system, becoming more distant as a way to protect herself from the intensely negative feelings of being rebuffed. Rebecca’s child-reading system—her intense interest in the moment-to-moment interactive experience of mothering—was active during the first few weeks after Eric’s birth. As the stress of childrearing intensified, however, she became hypervigilant for any signs of distress, anger, or rejection in Eric’s facial expressions, body language, and sounds. The smallest signs of anger in his eyes or voice triggered her amygdala to set off the defensive reactions that were already primed to be released. This threat-detection system is activated within a tenth of a second, so Rebecca found herself becoming defensive without knowing why. The stress of child-rearing, intensified by her own history, constricted her child-reading system and biased it toward negative perceptions, leaving her feeling rejected by her infant. As we came to better understand Rebecca’s reactions to her son, we began to realize that Dan’s reactions to Rebecca had mirrored those of a parent experiencing blocked care. Dan’s approach and reward systems had begun to weaken when Rebecca had failed to respond consistently to his care. His client-reading process had gradually begun to take on a negative bias, while the meaning that he was coming to give to his treatment of Rebecca had become increasingly pessimistic, restricting his own sense of possibility for her. Just as knowing the neurobiology of bonding and attachment had made us less likely to blame children for their behavioral struggles, understanding the neurobiological foundations of parental caregiving helped us stop blaming parents who weren’t attuning to their kids. Applying the concept of blocked care, we began with the assumption that insensitive parenting is often linked to stress and deficiencies in key brain systems, including the dopamine and oxytocin systems. Parents with blocked care may want to like and enjoy their children, but don’t know how to activate the “good chemistry” that would enable them to do so. Understanding the neurobiological causes of blocked care helped us become more open and empathic to parents’ negative experiences and stories, more willing to listen and validate their experiences. Perhaps the real lesson in this is that all of us—children, adults, and even aging therapists—are, to one degree or another, creatures of our limbic systems. All of us respond better to an approach encompassing playfulness, acceptance, curiosity, and empathy, conveyed with genuine smiles, soft eyes, gentle voices, an open posture, and a figurative hand held out in support. Few of us respond well to closed faces, defensive posturing, annoyed voices, or judgmental eyes. As therapists, we have the responsibility to rise above our limbic systems, to become the adults—even the parents—in the room, until we’ve managed to help our clients access their own better, more adult, more parental selves. This article addresses one of my pet peeves. People often say parents need to connect with their children and therapists with their clients right brain to right brain. The author points out, "This left-brain system is keeping Sarah in her brain’s approach mode, fully engaged with Vincent, and is activating her brain’s reward system as well." Generally a whole brain is better than a half brain. The left brain keeps the mom in approach mode and when the child is in distress a healthy right brain can recruit empathy areas (dorsal medial PFC???). When we can help parents experience their distress reactions to childrens' reactivity in session, then we can be the good parent, helping them observe their distress (with their insulas?) until they regain calm and there is sufficient blood in their forebrains to gain new insights. To do this we are providing oxytocin and our own sustained attention (from the dorsal anterior cingulate gyrus?). Parents reactivity needs to be processed before they can follow parenting guidance.